As I mentioned previously, a skunk has been visiting my apiary at North Cooking Lake for the past few months. I’ve trapped two skunks so hopefully my yard is now skunk-free. I first noticed them back in late winter. There were small tracks in the snow around the hives. I knew there was a fox around so I assumed they were small fox tracks (oh, I should have looked more closely!). 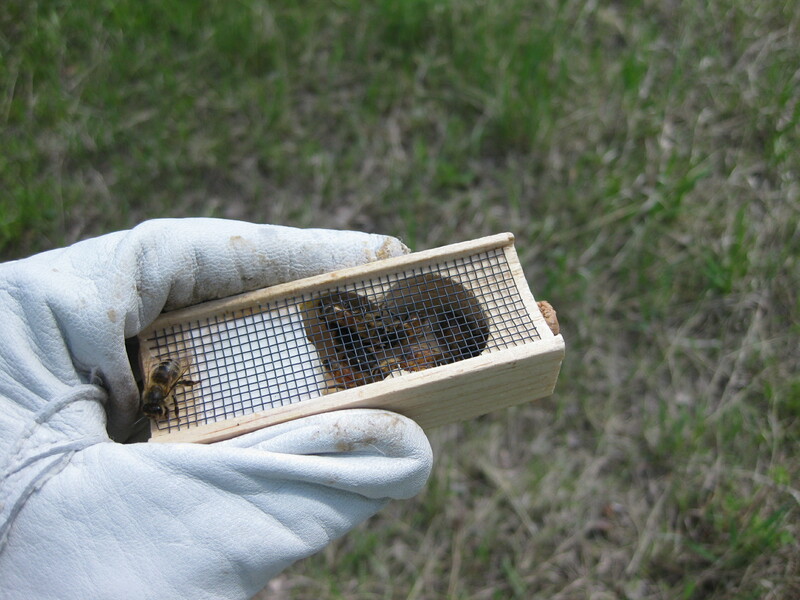 But then one evening I wandered by the beeyard and interrupted a skunk at one of the hives! I realized I had been seeing skunk tracks, not small fox tracks! They’ve been pestering four hives in particular and the attitude of the bees have changed dramatically. The skunks keep knocking off my entrance reducers, which is how I can tell which hives they are visiting and how frequently, and eating the bees when they come out to defend their hive. Now when I go near these hives or open them up, the bees are very aggressive and attacking me much more than the other hives. The skunks have got to go! -electric fencing strung about three inches off the ground around the bee yard. -wood frames covered with chicken wire placed in front of each hive. The idea is that the skunk can’t walk on the chicken wire. A similar idea to texas gates for cattle. I’m going to try this if I have more than two skunks. -CritterGitters. A battery-operated device that emits an obnoxious noise when an animal’s movement or heat activates it. I haven’t tried this but if I have anymore skunks I’m going to get one of these too. -Shoot it. This is the default option everyone immediatly suggests when they hear I have a skunk. However, it’s more difficult than it sounds! Apparently they stink like crazy if you don’t instantly kill them and I don’t want my beeyard stinking for years. And how am I supposed to find and shoot a skunk outside of my beeyard? And I don’t want to kill the skunk, I just want it out of my beeyard. -Strichnine. Really??!! I read Robyn Davidson’s book Tracks a number of years ago and believe me, anyone who has made it to the end of that book will never in a million years consider using strichnine. It’s a horrible way to die, not to mention that’s it’s also an illegal substance. And those are all the suggestions I’ve had for getting rid of skunks. Trapping is working for me but it’s a bit time consuming. It’s taken me about twleve nights of setting traps to catch two skunks. Both have taken a really long time to leave the trap when I’ve released them. I think they’d rather stay holed up in the trap for the day (because they’re nocturnal) than venture out into broad daylight in a strange area. It’s taken them each 1.5-2 hours to leave the trap once I’ve opened the door. So I think a combination of methods is best- put out chicken wire frames and trap them? If trapping doesn’t work or you can’t find a trap to use, try critter gitters. The nice thing about the traps is the skunk is gone once you get it, as opposed to being deterred but still around for when the frames or critter gitters are removed. This time of year I’m answering lots of questions about how the bees did over the winter. 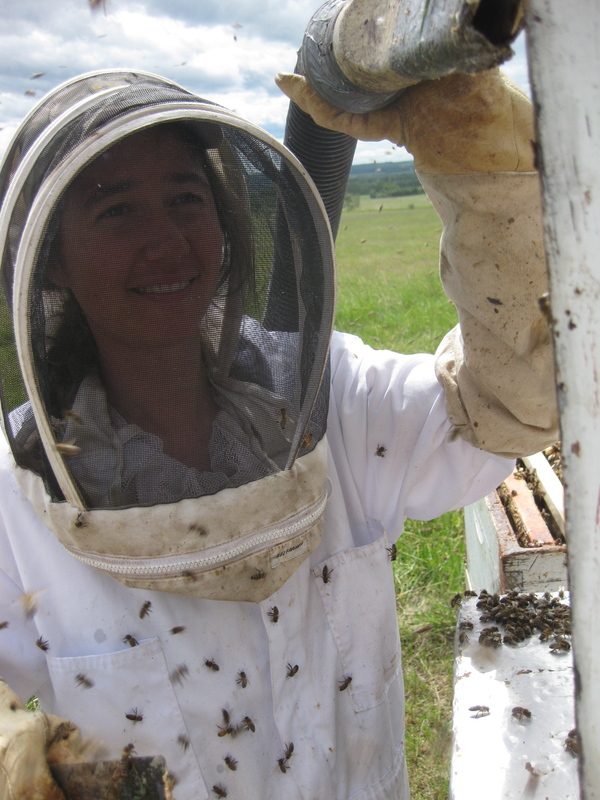 The answer: overall, from what I’ve been hearing from other beekeepers, the mild was winter was good for Alberta bees. 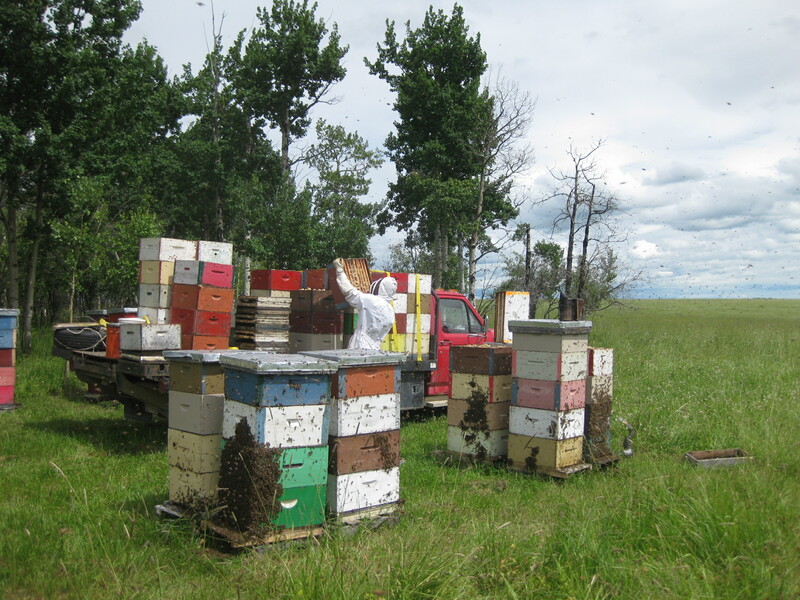 At our apiaries we had very, very few losses- less than 3%! The bees have already been collecting pollen for a couple of weeks now and we’re going to unwrap them soon. 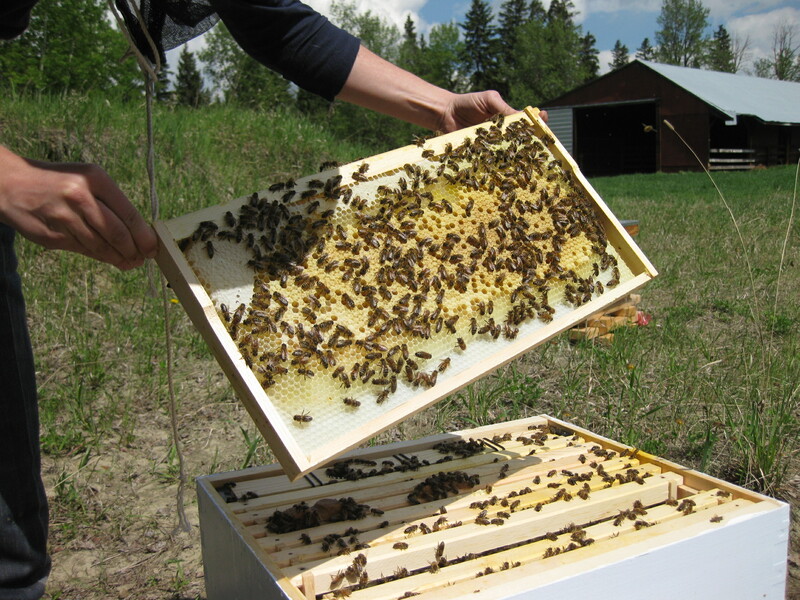 We’re looking forward to a great year of healthy bees and honey production. I’m excited to be able to offer our dandelion honey in late June; we’ve been sold out of it since December but people still ask for it every week. And by July we’ll have our much-loved wildflower too. This summer, there will also be a new face at our stall: Becky, my sister, will be working the stall while Dan and myself are out with the bees. So say Hi to her when you see her! One more update from the beeyards: unfortunately, I have a skunk eating bees out of my apiary. We’ll be trapping it this weekend. Skunks can be big pests around beehives. They scratch at the front of the hive and when the bees come out to defend themselves they get caught in the skunk’s fur. 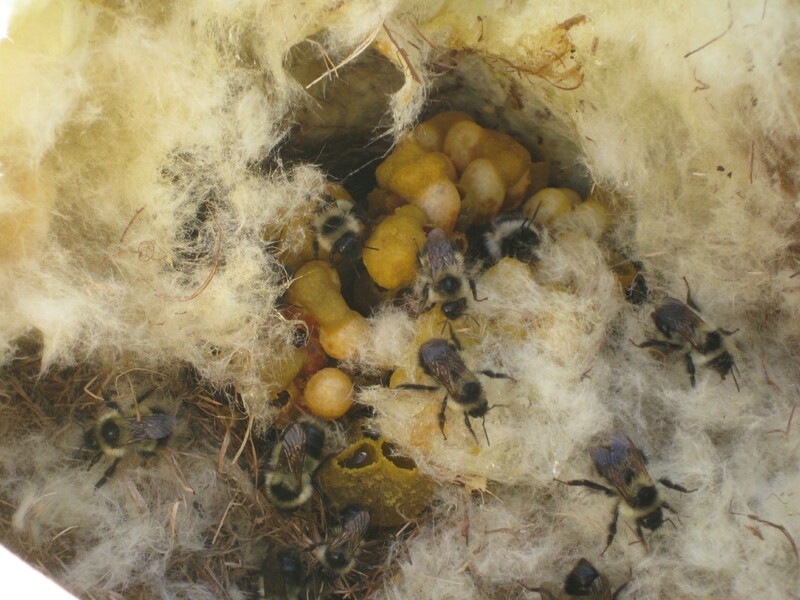 The skunk then picks them out and eats them, slowly de-populating the whole hive this way. So we have decided the suspiciously rotund skunk marauding the bee yard has to be relocated somewhere else before it becomes a skunk family. Before I explain the photo, I will describe how bees overwinter. Bees do not hibernate- they remain active all winter, eating honey to give them energy and shivering to stay warm. They form a tight ball, or cluster, to conserve heat. In the centre of the cluster the temperature is usually around 32C. 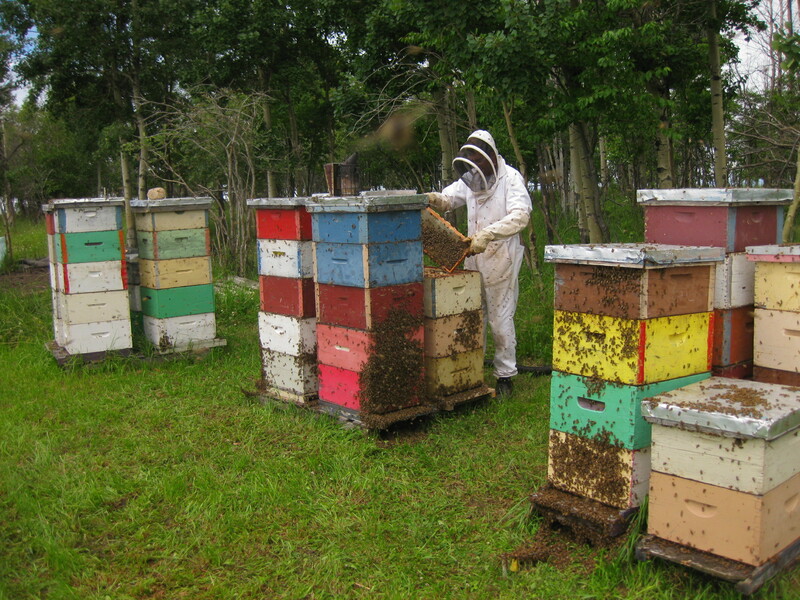 Beekeepers often put insulation around the hives so the bees do not need to work as hard to stay warm and to protect from sudden swings in temperature. Bees can go a long time without defecating in the winter, but they need to take cleansing flights occassionally. 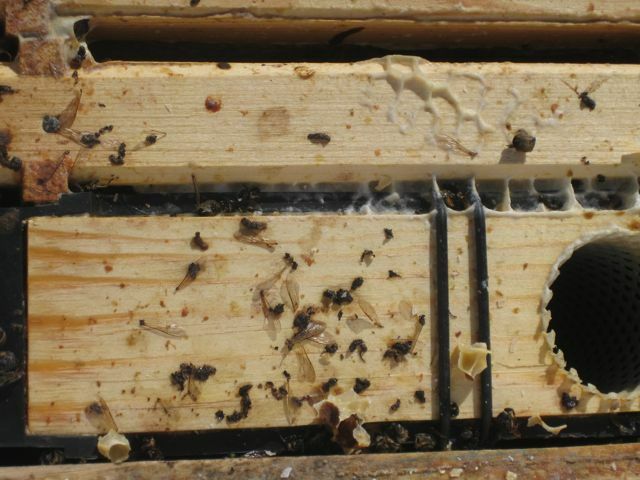 Defecating in the hive is unsanitary and can spread diseases so honey bees will not do it unless something is wrong. 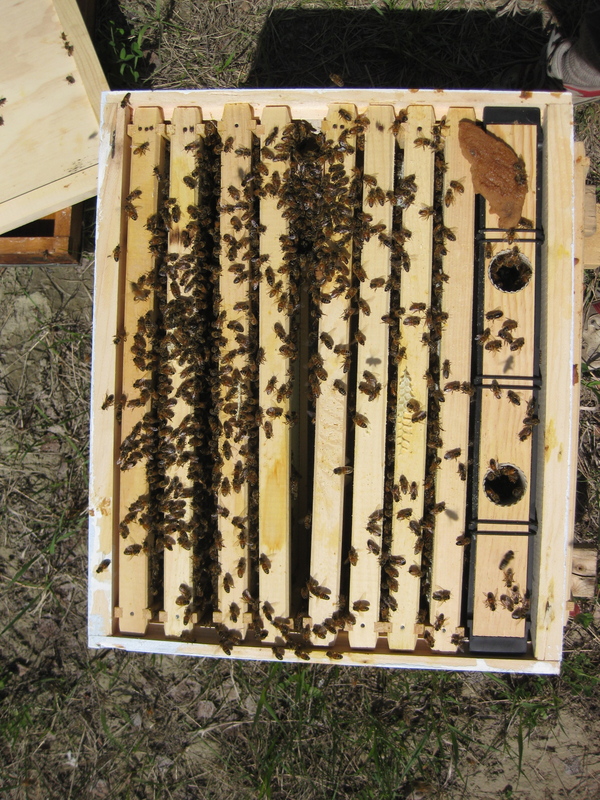 Successfully overwintering a hive is the most challenging part of beekeeping (in my opinion). If a colony is in tip-top shape, with plenty of bees, plenty of food, and no illnesses or weakened immune systems, and if the winter weather is favourable, a colony will live. If one or two of those variables are not optimal, the chances of a colony surviving winter are lessened. And now to the photo. All those brown specks are bee poo, which should not be in the hive. You can see the remnants of the frozen cluster in the upper left, just beside the shadow. I didn’t take off the top box to look at the bottom one; the cluster may extend down and become larger. 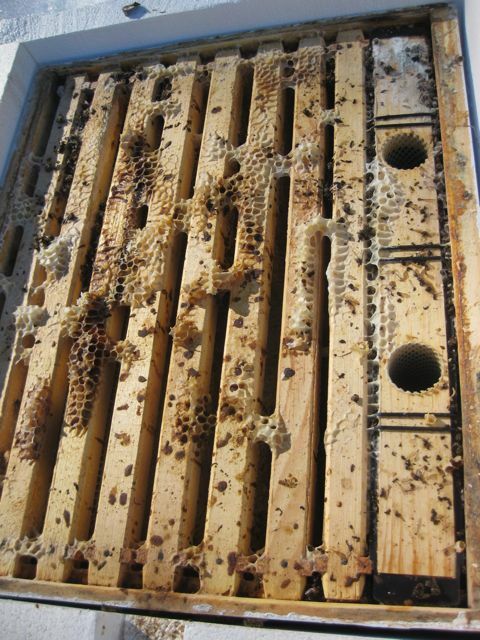 To my surprise, there was lots of honey still in the combs. I had assumed they had starved but apparently something else happened. There were also many dead bees immediately outside the hive. Figuring out what went wrong is a bit like a detective mystery. My best guess is that the bees got dysentry. Dysentry is not a disease in itself, it is symptom. It simply means the bees got diarrhea because they were eating something that was hard for them to digest. The sugar syrup I fed them this fall to help them build up their winter food stores may have fermented, which can cause dysentry. But that’s just a guess. I’m not really sure what happened. I was also surprised that there were so many bee parts, rather than whole dead bees. Maybe the bees were carrying dead bees out of the hive and in the process the bees were falling apart, being frozen and brittle. If anyone has any suggestions on what happened to my hive over the winter feel free to leave a comment. I’ve finally sorted out the issues with my queen bee (see the drone layer post) and I thought I’d post a few photos of good brood comb, drone-laying queen comb, and a sign that your queen introduction isn’t going well! Drone cells in centre left. The pattern shown, with bullet-like protrusions surrounded by empty cells, indicates a drone layer. The dark cells around the drone cells contain pollen and are normal. The queen comes in a cage with a few attendant bees. The white on the left is the candy, which the bees eat to release the queen. Once I killed the existing queen I should have waited three days (72 hours) before introducing the new queen. Taking what the weather was providing, I put my queen in after two days. The queen cage is hung between two frames and the bees are supposed to ignore it. Over the next three days the queen either has the candy plug eaten out by other bees until she can escape, or you need to release her on that day if she hasn’t managed to get out yet. If one introduces a queen too early after killing the old queen, which I did, the old queen’s pheromones haven’t dissipated yet and the bees attack the new queen. This is called balling and you can see it developing in my photos. The queen cage is in the upper center, obscured by the ball of bees. Balling is bad because the bees chew at the queen through the mesh screen of the queen cage and can eat the pads of her feet off. With hollow legs and a circulatory system that doesn’t have arteries or veins, the queen call slowly ‘bleed’ to death with the pads of her feet gone. Grisly but no worries, my queen appears to be fine and happily laying lots of eggs now. 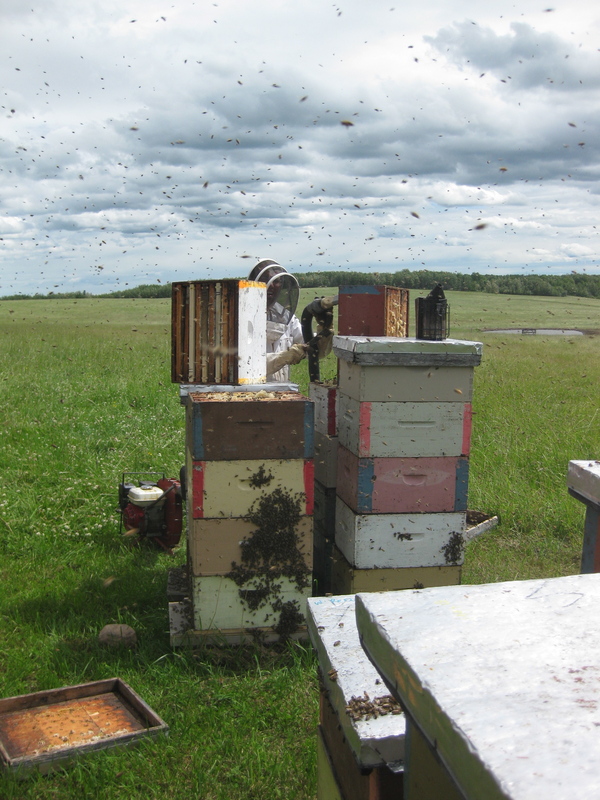 Just another demonstration of the precise and time-dependent nature of beekeeping. “Think like a bee” is becoming my new motto! 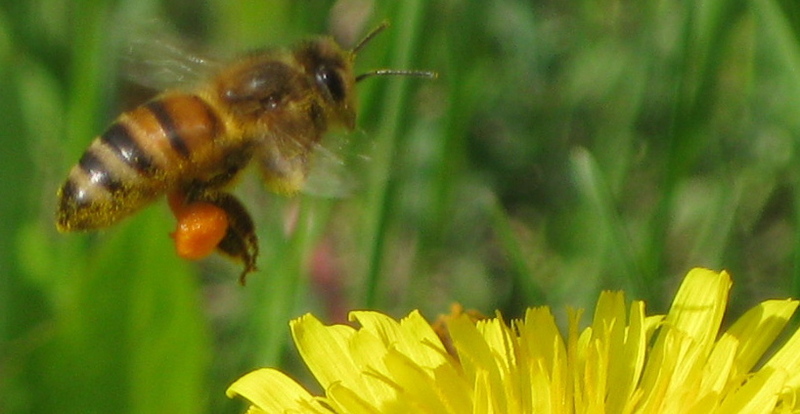 Dandelions are the first major nectar flow of the season.